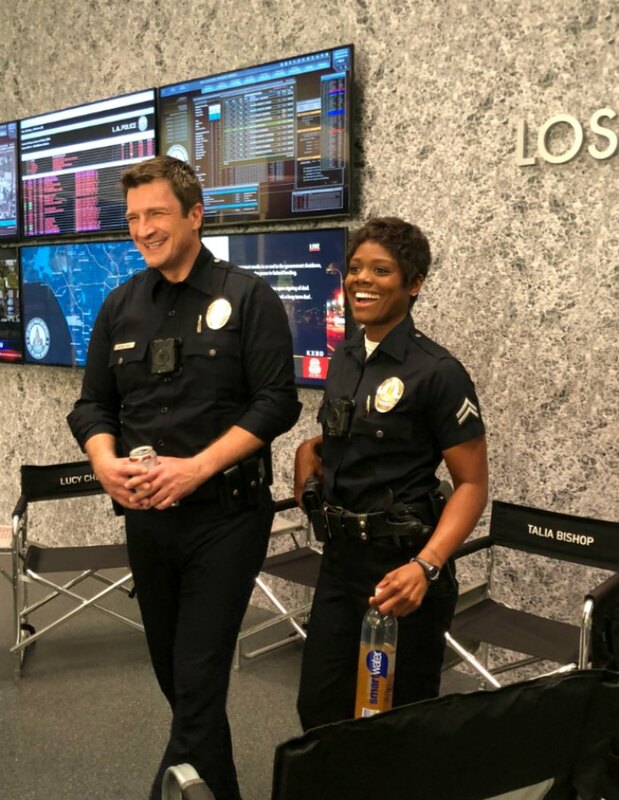 The series stars Nathan Fillion as John Nolan, Alyssa Diaz as Angela Lopez, Richard T. Jones as Sergeant Wade Grey, Titus Makin as Jackson West, Mercedes Mason as Captain Zoe Andersen, Melissa O’Neil as Lucy Chen, Afton Williamson as Talia Bishop and Eric Winter as Tim Bradford. It’s a great cast and a fun show! And how fun is it that we go to see quite a few of them on set! 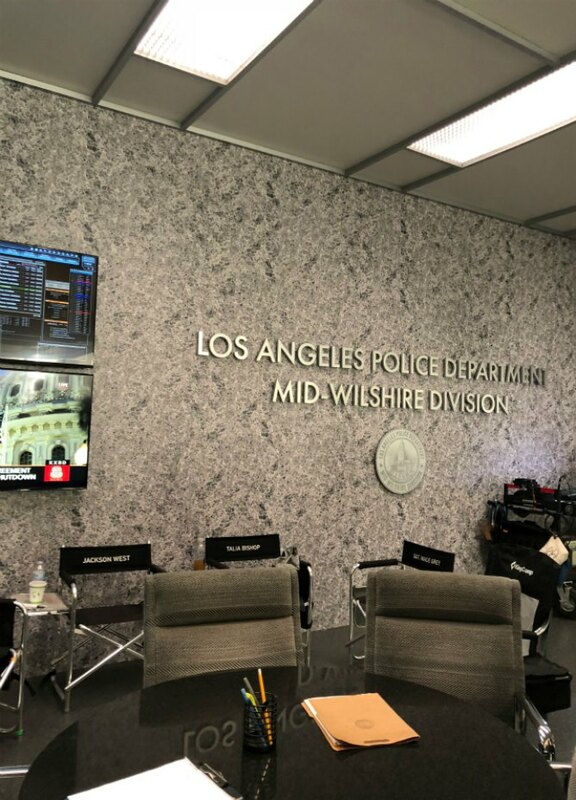 In fact, Mercedes Mason actually took us on a tour of the set!!! She was SO awesome – seriously so easy to talk with! She made everything so fun..and she came in ON HER DAY OFF to do it! How great is that?! We even got to go “hang out” in her office! 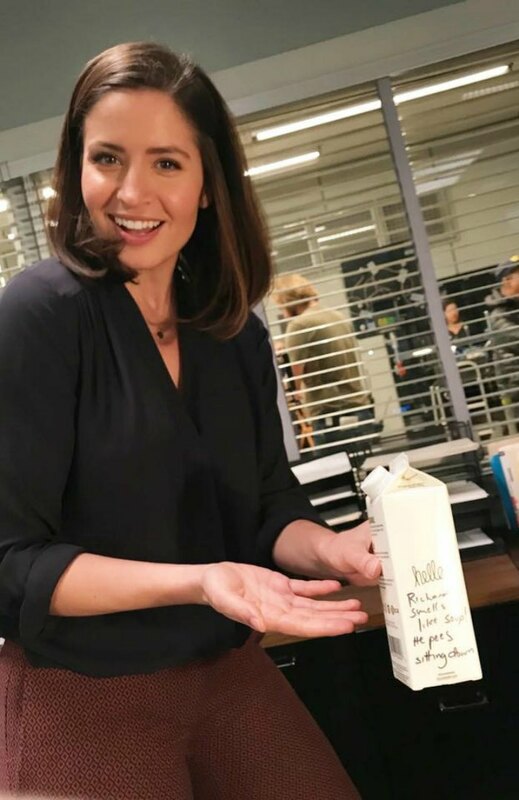 😉 And as you can see – she writes hilarious notes to her fellow cast members on things in her office! LOL! Too funny! Not sure I’d make a good police chief though! Lol! 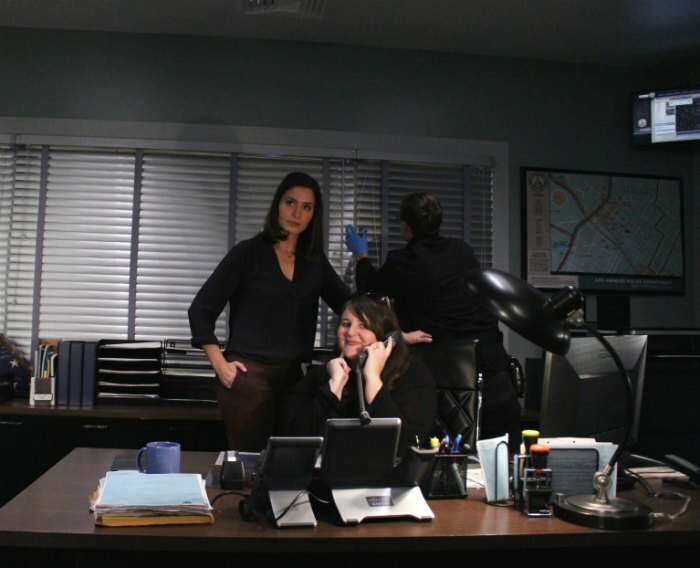 And then, it was a super fun surprise that the show’s star Nathan Fillion was on set that day. We rounded a corner and there he was hanging out with Afton Williamson! You know we had to get a group photo!!! Seriously – how fun is that?! And yes…Nathan Fillion is touching me! Just in case you were wondering! 😉 Though our time on set was quick, it was SO much fun! Seeing the sets and whole process in action is always so fascinating! The number of people it takes to put the shows together is CRAZY! And the sets are always such a fascinating juxtaposition of fully themed, “show world” items and “real world”, not set-designed things. So interesting and cool to see! So, I’m even more excited to tune in to the latest episode! Make sure you’re watching on Tuesday nights! “The Hawke” was written by Fredrick Kotto and directed by Timothy Busfield. 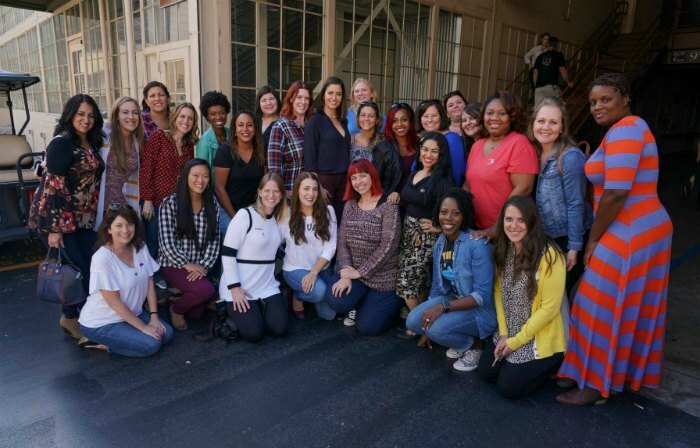 Alexi Hawley is writer and executive producer; Mark Gordon, Nathan Fillion, Michelle Chapman and Jon Steinberg are executive producers on the series. 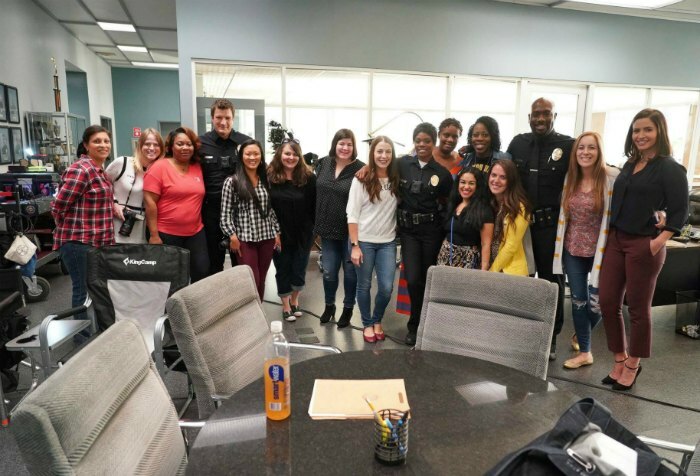 Liz Friedlander directed and executive produced “Pilot.” Entertainment One (eOne) is the lead studio on “The Rookie,” a co-production with ABC Studios. 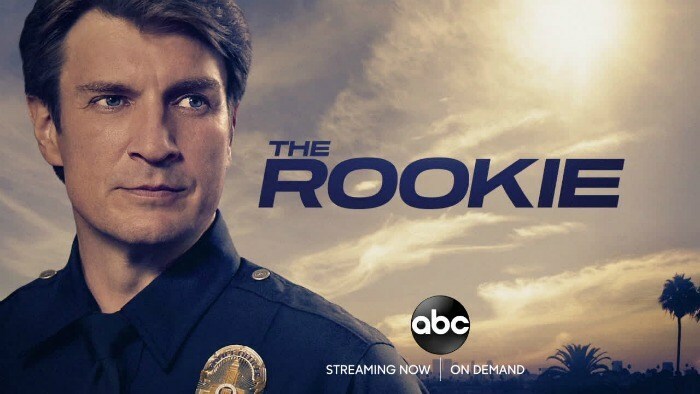 “The Rookie” airs on Tuesdays at 9:30|8:30c on ABC, and can also be watched via streaming (ABC app/ABC.com/Hulu) and on demand.